Please welcome today's paranormal guest author Desni Dantone! Desni is the author of IGNITED and SACRIFICED. Desni: I started writing when I was eleven. That summer, I found one of my mom's Dean Koontz books and read it in one day. When my mom told me he came from the same hometown as me, I was totally inspired and wanted to be just like him. I started writing little horror stories and gave them to my mom to read. I'm sure they weren't as good as she led me to believe they were at eleven, but that was the start of my passion. Desni: I honestly never thought about that. I went through phases of writing horror, then drama, then contemporary romance, but I never really got to the point that I was ready to publish any of those books that I wrote. Young adult paranormal romance and urban fantasy novels are typically what I like to read, so when I started writing the first book in the Ignited Series, I think it came more naturally to me. For the first time, I completed a novel that I was completely happy with and ready to publish. I guess it's true that you should write what you love. Desni: The life of a vampire or demon hunter sounds exciting and dangerous, and they usually have some pretty cool talents. If I could have any talent, it would have to be supernatural speed, so I could actually accomplish everything I need to in a day...and land a kill shot without breaking a nail. Desni: Fans of the Ignited Series are going to enjoy the element of mystery that continues in Sacrificed, as more pieces of the big picture are put into place. The romance that was just starting in Ignited picks up in Sacrificed, with a lot more sizzle that I know Nathan fans will be happy with. The paranormal element picks up in this book as well, as the main character, Kris, discovers more of what she's capable of. There will be mysteriously magical elements intermixed with action and romance, a fast paced story line, a fun gang of characters that will make you laugh and cry, and twists that will leave readers guessing what's next. Desni: For Kris, I would choose Erin Moriarty. She plays Vince Vaughn's daughter in "The Watch." She has this natural beauty thing going on, and her strawberry blonde hair is a perfect match for Kris. For Nathan, I would choose a cross between Theo James for his rugged handsomeness and Chase Crawford for his boyish good looks and blue eyes. For Alec, Luke Grimes because he's hot...and looks like he just might be trouble. 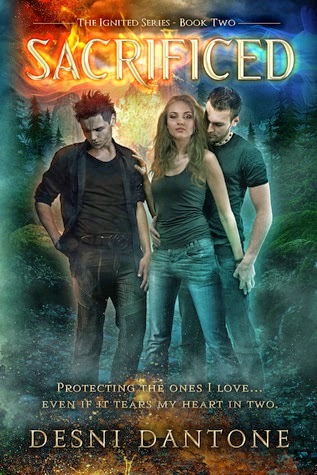 Sacrificed (Ignited #2) by Desni Dantone. Kris Young is no normal seventeen year old. Only one person can stop her. When she meets Micah, she doesn’t expect him to save her life, or to offer his help. They were born enemies after all. Though he boasts noble intentions and a belief that, together, he and Kris could swing the tide of the war to the side of good once and for all, Kris can’t help but suspect that he is hiding something. Strengthened by new allies, Kris and gang take their fight to the Skotadi. As they discover shocking secrets and grow closer to learning of the evil-doers ultimate plans, Kris worries that time has run out. Struggling with her inner demons, she does the only thing she can to protect the ones that she cares about most, even if it tears her heart in two. Question is, where will her heart lead her? Thank you Desni for joining us here today at From the Shadows! To learn more about Desni Dantone and her books, please visit her website. We are giving away an ebook copy of Sacrificed by Desni Dantone to one lucky winner! To enter, please leave a comment on this post and include your email address so we may contact you if you win. This giveaway is INTERNATIONAL. Giveaway ends April 25, 2014 midnight EST. Supernatural speed would be handy. I'm loving the cover.